The region is proposing segregated bike lanes from Charles to 7 on both sides of Ottawa (pages 102 and 112 Appendix B). I guess this would connect to a mix of regular cycling lanes, and mixed-use trails on the other side of 7 (also in same link). Great news! Makes sense to do it at the same time the rest of Ottawa is re-done. (11-03-2014, 10:44 PM)Pheidippides Wrote: The region is proposing segregated bike lanes from Charles to 7 on both sides of Ottawa (pages 102 and 112 Appendix B). Yes, it looks like it would connect to Iron Horse on the West side. This is great. I wish they would take it a step further and tackle the segment of Ottawa further to the west, though. Actually, I just wrote to Jane Mitchell yesterday about that. CBC had a piece about the Region's worst 10 intersections, and 3 of them are on Ottawa: Ottawa and Fischer-Hallman, Westmount, and Homer Watson. (When my spouse bike commutes to work, she needs to take Ottawa from Kehl to Strasburg. It's short, but easily the worst part of that ride.) Unfortunately, this project doesn't address that part at all. And Strasburg includes a bike path too, so it would make sense to extend west from that respect. I was surprised to read that Ottawa is a core cycling route. It is by geography: you can't avoid it, really. But it's also really hostile right now. Still, with Manitou and Ottawa getting segregated bike paths, that part of Kitchener is starting to get some good bicycle infrastructure! This is such a dangerous section of road, I used to ride to high school in the 90s from Strasburg to Cameron Heights. I'm not keen on sidewalk riding but it's really the only way to ride safely in that area if you're doing it during normal hours. I think the plans for the roundabouts at HW/Alpine/etc. all have multi-use trails criss-crossing the area but I don't recall details. It would be nice to see a continuous stretch of asphalt running from the Iron Horse to at least Westmount but ideally up to F-H.
(11-04-2014, 11:40 AM)clasher Wrote: This is such a dangerous section of road, I used to ride to high school in the 90s from Strasburg to Cameron Heights. I'm not keen on sidewalk riding but it's really the only way to ride safely in that area if you're doing it during normal hours. I think the plans for the roundabouts at HW/Alpine/etc. all have multi-use trails criss-crossing the area but I don't recall details. It would be nice to see a continuous stretch of asphalt running from the Iron Horse to at least Westmount but ideally up to F-H. Yes, it is clearly the worst around. Strasburg to Cameron Heights along Ottawa sounds bad. At least there aren't a lot of driveways along the sidewalk (or many walkers for that matter). There are a number of parks around there. What about connecting from Iron Horse to Shoemaker Greenway, Meinzinger Park, and across the Conestoga Parkway at Strasburg or at Concordia Park? The redevelopment of the Schneiders Meats site will be an opportunity to create that link between the Iron Horse Trail and the parkway network. (11-04-2014, 01:52 PM)panamaniac Wrote: The redevelopment of the Schneiders Meats site will be an opportunity to create that link between the Iron Horse Trail and the parkway network. Yes, I had only looked at the map view and not the satellite view. ("Why is there a big empty space there?") Intelligent redevelopment of that area would indeed fill in a critical missing link. A question for cyclists. A report this week on the Region's dangerous intersections (Ottawa St and Homer Watson, come on down! ), the intersection of King St E and Cedar St was cited as the most dangerous for cyclists, with I think seven collisions last year. What's the deal with that? It seems like a fairly mundane intersection, although with more turning cars than average. (11-08-2014, 06:12 PM)panamaniac Wrote: A question for cyclists. A report this week on the Region's dangerous intersections (Ottawa St and Homer Watson, come on down! ), the intersection of King St E and Cedar St was cited as the most dangerous for cyclists, with I think seven collisions last year. What's the deal with that? It seems like a fairly mundane intersection, although with more turning cars than average. I'm guessing that it's due to the higher-than-one-would-expect traffic due to the market. I think there's also a fairly steep hill on Cedar from Church to Charles, but that shouldn't really be an issue. On the other hand, I'd expect that the severity of collisions would be lower at Charles&King vs Ottawa&anywhere due to the volume of traffic that is doing maneuvers. I don't think there's anything terribly misdesigned about that intersection. It's a busy intersection for pedestrians and bikes during the week as well, I often ride through it on both streets... the lanes don't have room for a car and a bike to ride side-by-side safely... the "single-file sharrow things" they painted on the road start south of Cedar somewhere but the lane only starts to narrow close to the intersection. Here's a map of the area, note the scale. 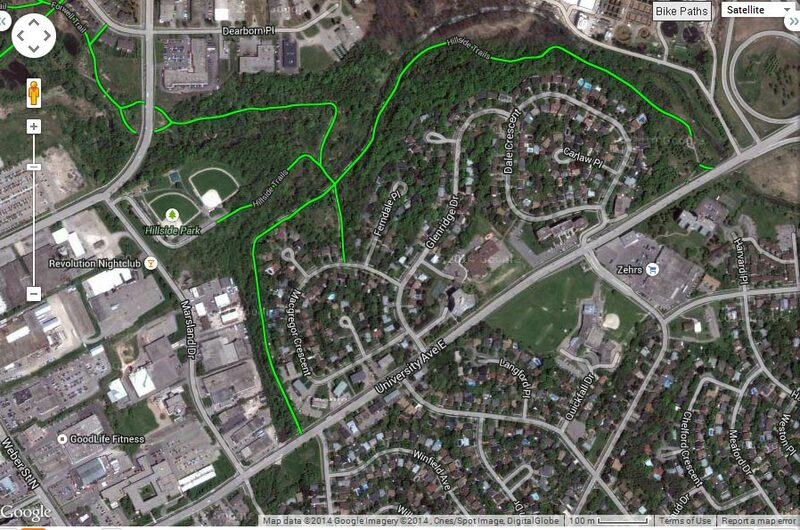 I rode through this path yesterday and when it's done it really does make riding to Conestoga Mall from Uptown a much more realistic proposition for some people. Unfortunately the gap in that plan is the mini-speedway that is the 4 lane stretch of Lexington between Weber and Davenport. I rode down Lexington around 4:30 and the right-hand lane was blocked off for some pipe repair and traffic was flowing rather quickly despite most of the other roads in that area being congested with rush hour traffic. I really thing not doing the road-diet on Lexington was a huge mistake and it looks especially obvious now with the rest of Lexington (and Davenport) having cycle lanes. There are other improvements on University to go along with the path, there's a small island east of Marsland where the trail crosses and they've painted sharrows on Carter Avenue to lead cyclists down to Moses Springer and on to the path that follows the creek up to Waterloo City Hall. I hope they put some sort of map or signage to help direct people, it's pain to cross at the lights at Lincoln Road or you can cross at MacKay if the traffic on Weber is in your favour and then just continue on the path. I think they should put a crossing island on this part of Weber it might keep traffic speeds down a bit too. (11-12-2014, 09:33 AM)clasher Wrote: There are other improvements on University to go along with the path, there's a small island east of Marsland where the trail crosses and they've painted sharrows on Carter Avenue to lead cyclists down to Moses Springer and on to the path that follows the creek up to Waterloo City Hall. I hope they put some sort of map or signage to help direct people, it's pain to cross at the lights at Lincoln Road or you can cross at MacKay if the traffic on Weber is in your favour and then just continue on the path. I think they should put a crossing island on this part of Weber it might keep traffic speeds down a bit too. There is a tunnel under Lexington so there's no need to dodge four lanes of traffic when crossing it. Unfortunately that's where the city's enlightenment ends. As you point out, crossing Weber to get from the mall and Moses Springer is a disgrace. So is crossing Bridgeport Road at Laurel Creek and to a lesser extent crossing University. At least there's a traffic light at Marsland for the latter crossing. What's needed is either more tunnels or at least button operated traffic lights like the Erb St crossing. Only then will it be safe and attractive to walk or cycle between the Conestogo Mall area and Uptown.